Announcing the release of KVAP Version 4.2 - Kalsi Engineering, Inc. Refined methodology for predicting the pressure-dependent forces of balanced and unbalanced globe valves. DC motor methodology which accounts for the effect of motor load, voltage, and heat-up when determining motor-operator output and valve stroke time. The DC motor methodology is fully integrated into KVAP, allowing the user to make use of KVAP’s state-of-the-art valve prediction models. Methodology for motor operator stem nut wear prediction. Catalog feature to document ASME OM Code Mandatory Appendix III-9100 data. Refined hydrodynamic torque coefficients for eccentric plug valves. High flow gate valve prediction methodology refinements, and development of complimentary tools to understand gate contact modes and potential for gate, rail, and seat damage that may occur due to high energy line break. Kalsi Engineering was the original model developer of the EPRI PPM Gate Valve Model. KVAP 4.2 builds on the KVAP 4.1 model and provides equivalent predictions to the EPRI PPM High flow model. KVAP 4.1/4.2 includes an integrated flow model and Westinghouse Gate valve model, which is unique in the nuclear power industry. Through the development of KVAP and other engineering tools, Kalsi Engineering continues to lead the effort of providing plant engineers with valuable tools to ensure reliability and support root-cause analysis. 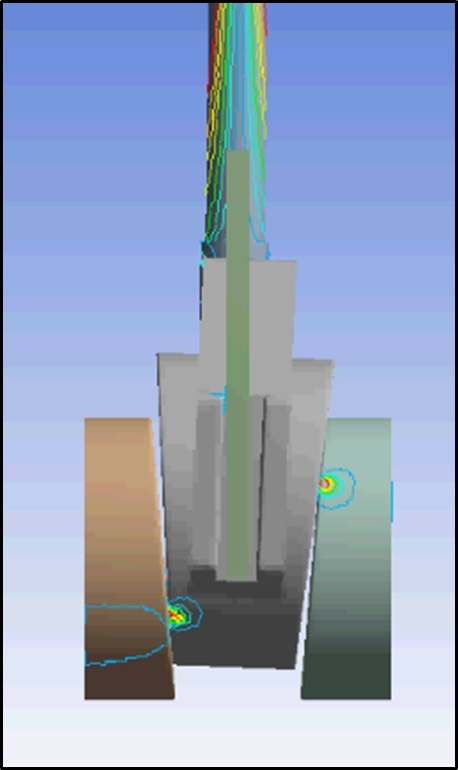 Kalsi Engineering has developed tools to view the gate contact modes and has utilized complementary software packages to provide additional insights into high-flow induced gate valve damage. KVAP™ remains the most technically advanced air-operated valve (AOV) and motor-operated valve (MOV) design calculation software in the industry. With the release of KVAP 4.2, Kalsi Engineering again confirms its commitment to the US and international nuclear power industry. KVAP 4.2 is ready to help plant engineers implement ASME OM Code Mandatory Appendix III and Appendix IV functional margin determination. Contact our staff for additional information.